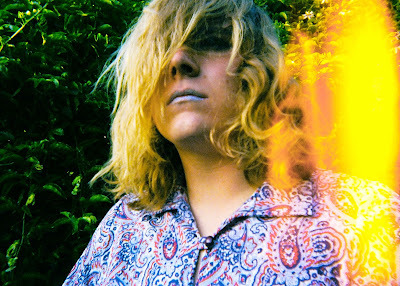 On Tuesday, Ty Segall will drop yet another album. The awesome Singles 2 -- or $ingle$ 2 as it's sometimes being written -- is a collection of singles made between the time he made a few of his recent albums, including Twins (2012) and Sleeper (2013). Singles 2 is a fantastic record and the perfect introduction to this guy's stuff for anyone out there who could have inexplicably not gotten on-board the Ty train by now. You can find out for yourself when Singles 2 is released by Drag City tomorrow. "Mother Lemonade" is all Woodstock-era fuzz and Detroit-styled exhortations. It's amped out agression from decades ago made into the indie of the 21st century...and a succinct distillation of the Ty Segall formula as well. An unrecognizable cover of "Femme Fatale" adds to the magic of the record. Shredding the soft edges of the song, Segall turns the cut into something T. Rex would have roared through in front of a sea of screaming Brit teens at Wembley some decades ago. "Children of Paul" and "It's a Problem" bring the melodic charms. Both tracks echo the Beatles or, better yet, The Move when Roy Wood pushed them into being a louder band. $ingle$ 2, or Singles 2, is a quick education into what makes Ty Segall's music so exciting and infectious. Spin the one-two punch of album openers "Spiders" and "Hand Glam" and you'll get the message. This is gloriously fuzzed out, grungy (in the very best sense of the word's meaning prior to the rise of Sub Pop), wigged out rawk. I defy anyone not to get turned on by this one. Singles 2 by Ty Segall is out on Tuesday, November 18, via Drag City. For some weird reason, I'm only now catching up with Manipulator, the August 2014 release from Ty Segall on Drag City. The record -- double album in length -- is a monster. It at once delivers the goods we know Ty is capable of but also shows signs of new directions -- the expansive and amazing "The Singer", for example. The title cut is the sound of all those US bands who tried to sound British in the wake of The Beatles in the mid-1960s. If "The Flintsones" had turned The Way-Outs into a real band and hired a bunch of garage rockers to fit the suits Johnny Bravo-style, the results would have sounded like this. A masterpiece! Ty stretches his vocal style a bit on "Feel" where the familiar formula is mixed with a new sense of melody to indicate how Manipulator can serve as an indication of new directions for the performer, as well as an awesome collection of the guy's music. The record is long but just when you think he's running out of steam a new rocker rears its head. "The Crawler" is an unholy beast of a jam. Think MC5 and The Stooges playing a beach party for a bunch of rich kids. Riffs on top of riffs brothas! Manipulator by Ty Segall, out now on Drag City, is an impressive collection of the best sort of stuff that this guy is capable of cranking out on a routine basis. It's a buffet of riches that best works as a collection of tunes and not as much as a cohesive, long record. By no means is that a criticism; from me that sentiment is the highest compliment I can give any collection 'cause I want the cuts to to each work on their own, out of the context of the rest of the overall album. Manipulator plays like a compilation and you can cherry-pick any tune here and plop it down on your iPod and be rewarded when it comes around in a mix. Better yet: plop all of these riff-rockers down on your iPod. It's easier that way.